In my previous article “Mysterious Pavilion: Document in stone of astronomical events” (published in Asian Art, 1 February 2010 http://www.asianart.com/articles/pavilion/index.html ) I reported on my accidental discovery of a pavilion near Mahabalipuram where unusual reliefs on the ceiling expressed astronomical events through unusual symbolism. At that time these reliefs and their astronomical and (art)historical implications seemed to be like the pavilion itself: isolated, away from any relevant link or context in the landscape. A one-off, unique. Amazingly interesting and mysterious. Maybe even impossible to interpret beyond speculation. Over the past half year intuition combined with vaguely remembered leads from the tradition sent me on several field trips across Tamil Nadu. The outcome is astonishing. One pavilion depicting eclipses is accidental. Two, three and more makes it a phenomenon. It establishes a new pattern and context which calls for further study and which may and should be interpreted. My field trips took me to Bhavani on the banks of the river Caveri, near Erode, to the Sangameshvara temple, to Kanchipuram, and along the banks of the river Palar. In all these temples and places I found eclipse depictions connected to unusual symbolism in different architectural contexts, of which several were pavilions very similar to the first one in Mahabalipuram. The Sangameshvara (the Lord of the Confluence) temple in Bhavani is situated on the tip of land where the Caveri river and the Bhavani river flow together. It is a place of great spiritual, cosmological and astronomical significance . According to the mythology a third river also joins the confluence at this place. It is the Akasha Ganga, also called the Amrita Vahini, the Ganges of Heaven, or river of Ambrosia, the Drink of Immortality . The Milk Way is in ancient doctrine the path taken by the souls of the deceased which would take them to rebirth or to moksha, depending on their spiritual merit. In the tradition the Sangameshavara temple in Bhavani is still a place where many come to perform the rituals for deceased family members, and for the performance of meditation and ritual on the occasion of solar and lunar eclipses. One of the most intriguing depiction of eclipses I have so far come across is found on a slab which stands out of context near the shrine of the consort of Shiva Sangameshvara, goddess Vedanayaki (Figure 1). This slab is without doubt what is left of the ceiling of an ancient pavilion . It is approximately 4 meter long and 65 centimeter high and at the center is a lotus medallion with three concentric layers of petals around its center, framed within a square (Figure 2). Flanking this square are a solar and lunar eclipse accompanied by elegantly coiled, crested dragons instead of the more plainly undulating cobras or nagas (Figure 3 and 4). In my earlier article on the pavilion near Mahabalipuram I had concluded the lotus medallions were related to the total solar eclipse, and possibly a symbolic depiction of the solar eclipse with the aura of the corona of the sun represented as lotus petals. On the ceiling of the pavilion near Mahabalipuram no immediate connection was established between the cobras with the solar and lunar disk and the lotus medallions, only a tentative one . In Bhavani the lotus medallion is flanked by the solar and lunar disks, which are being approached by nagas or dragon-like cobras. The disks representing the solar and lunar eclipses are also flanked by two pairs of birds. The solar eclipse is flanked by two parrots, while the lunar eclipse is flanked by two peacocks with cobras in their beaks. This eclipse depiction is without doubt the most elaborate and mysterious I have so far encountered. Next to this slab stands another, also without doubt once part of the ceiling of a pavilion It is approximately 6 meter long and 80 centimeter high. A structurally very similar, but much more elaborately carved lotus medallion is positioned at the center of this slab. It consists of three layers of lotus petals around a center which is now lost . The lotus medallion is bordered by a square which is decorated with small lotuses within squares placed on the cardinal directions. This lotus medallion must originally have been surrounded on all sides by a relief of dancers performing kollattam, the dance with sticks. This dance is a popular form of folk dance, but was also in the past performed in a ritual context. Now only the right and left section remain, as this slab seems to be the only part remaining of what once must have been an elaborate and beautifully decorated ceiling. As we can now say with certainty the lotus medallion represents the solar eclipse, we also can conclude that the two tigers which flank this medallion must be connected with eclipse symbolism. These two slabs are placed next to the shrine of the goddess-consort of Shiva Sangameshvara, who is called Vedanayaki (Figure 1). This shrine is still in its original, ancient form (Figure 6). The main sanctum can be dated to 12th century on the basis of its architecture . It is surrounded by a cloister of a later date, probably from the 16th to 17th century, and faced by a more recently constructed open hallway, but with its elaborately decorated pillared mandapa forming the entrance left intact. This mandapa also represents the period of the Nayaka dynasty and dates to approximately the 16th to 17th century, based on the style of the pillars . In the context of this article it is again primarily the ceiling which draws our attention. It presents us with an elaborate relief with the now familiar lotus medallion representing the solar eclipse in the center (Figure 07). This lotus medallion consists of three layers of lotus petals around the center, fitted in a square which is decorated with small lotuses on the cardinal points. This lotus medallion is special because parrots sit on the second circle of lotus petals and connect the outer circle with the inner. They are carved in the round, creating three dimensional bridges connecting the whole of the medallion. Four of these parrots are still in place, the others have been broken. The square encompassing the lotus medallion in its turn is surrounded by a concentric square relief panel in which 8 couples ‘play’ in kneeling positions, holding un-identifiable objects in their hands. Among these stands one single woman of smaller stature, possibly holding a parrot on her hand. This square on its turn is surrounded by a layer of bulbous decorations, outside of which are positioned 16 figures. On one side five figures are standing on lotuses, and are obviously deities. We can recognize Karttikeya or Murukan, two forms of Ganesha, Mahavishnu, and a Rishi. In the center of the two adjoining sides are Ganga and Yamuna, as they are also depicted on the central doorjambs of temple gateways. They are flanked by several deities. Opposite Karttikeya, Shiva is depicted as Urdhva Tandava Murti, Shiva dancing the vigorous dance with his leg lifted above his head. He is accompanied by his consort who is dancing by his side, Mahavishnu with Mahalakshmi on the corner on Shiva’s proper right, and Nandi playing the drum on his proper left . The full description, interpretation and meaning of this ceiling mandala will be left to another occasion. Here we only apply ourselves to those aspects which connect this relief with others with astronomical symbolism. Outside this mandala, on its corners, are depicted four symbols which connect this ceiling relief with others described in this and in my previous article, and which can now be understood as having astronomical significance. These symbols are a tiger, a bow and arrow, a mandala with five by five squares, decorated with a garland, and a makara, a mythological fish with an elephant’s trunk and tusks. A makara is also depicted on the wall of this pavilion (Figure 8). The makara has astrological significance as it is the symbol of the constellation and mansion of the zodiac which is known as Capricorn in the West. The mysterious animal depicted twice on the ceiling of the pavilion near Mahabalipuram may be interpreted as a tiger, as it has a striped coat . The presence of several reliefs of the sphinx or purushamriga in this pavilion may not be accidental (Figure 9). Another sphinx or purushamriga is found on one of the out-of-context pillars found in this temple complex. The presence of an Indian sphinx on the ceiling of the pavilion near Mahabalipuram, and also above the entrance of a Ganesha shrine in Bhavani itself indicates the possibility of a specific mythological or doctrinal link between the sphinx and eclipses. A structure within the temple complex of the Sangameshvara temple in Bhavani where the eclipse symbolism is more direct and obvious is the gopuram or temple gateway. 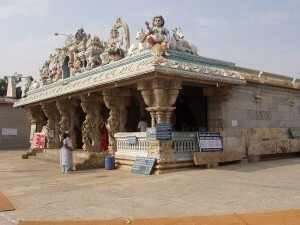 Due to the position of the temple on the peninsula at the conjunction of the Cauveri and Bhavani rivers, this gopuram is situated on the north side of the temple complex. The ceiling of the central passage shows the now familiar lotus medallion symbolizing the solar eclipse. Three concentric circles of lotus petals surround the center. The lotus is embedded within a low-relief square, and surrounded by twelve hamsas or swans, also arranged in a square. This is surrounded in its turn by a layer of decorative bulbs which borders the whole relief. On the corners are placed four nagas or cobras, twisted around their tails, in high relief (Figure 10). The whole arrangement is slightly rectangular instead of exactly square. On the east and west side of this are pairs of tigers, facing each other. On the north and south are two undulating cobras in low relief, in the manner of the familiar eclipse depictions. One of the cobras approaches a disk in the manner which represents a solar eclipse. Also depicted are two bows, a fish, and the five by five square mandala. On the walls of the passage way through the gopuram we find fish, single and in pairs, near the outer and the inner entrance. On walls of the two vestibules inside the gopuram we find the depiction of many fish, single and in pairs, a moray eel, a cobra, and an animal that could be a tiger. And at the inner entrance we find also depictions of the sun and moon, both accompanied by fish. On the east wall the disk of the sun is accompanied by two single and one pair of fish (Figure 11). On the west wall the moon is worshipped by three figures, and accompanied by one fish (Figure 12). The symbol of a bow is depicted nearby. Higher on the gopuram wall we find a small group of three worshippers, and one separate, under a lingam covered with a flower wreath. Under these figures is a mandala of three by four squares, covered with a flower garland. Next to the gopuram, within the temple compound, we find one more eclipse related relief. Here we find two small shrines, one dedicated to Karttikeya or Murukan, the other to Ganesha (Figure 12). These shrines can probably be dated to the 12th century and are similar to the shrine of the goddess. It is very probable these have all been built at the same time by the same architect. The ceiling of the front porch has a simple and clear depiction of the solar and lunar eclipse. There can be no doubt it belongs to the original open mandapa built as part of this shrine in the 12th century. A simple undecorated disk is framed by a square, on each side of which a cobra undulates towards the solar and lunar disk, respectively (Figure 14). Above the door of the shrine is a narrative freeze of the race between the sphinx or purushamriga and Bhima, an episode from the Mahabharata (Figure 15). Many hundreds of kilometers away I found another Ganesha shrine with eclipse symbols carved on the ceiling of its porch. On the road between Chingleput and Kanchipuram the shrine of Shri Cintamani Vazhittunai Vinayakar (Figure 16) has a relief depicting a solar and lunar eclipse together with a pair of fish (Figure 17). The relief has been recently painted, a witness to the living tradition. Another pair of fish which has been left un-painted is part of this eclipse relief. The pillars supporting this roof also have been decorated with sun and moon symbols and with a mysterious symbol the meaning of which will become clear later in this article (Figure 18). But the significance of this Ganesha shrine by the way-side stretches further. Next to it is a pavilion which has been restored and fenced off by the Archaeological Survey of India (Figure 19). It enjoys official protection due to its significance as a monument. This pavilion is structured with four by four pillars, with an open porch and closed on three sides by a wall. Its pillars, reliefs and roof place it in the period of the Nayaka dynasty. In its back wall is a pañjara which houses a relief of Lord Hanuman. Although it is not possible to enter the pavilion because of its protective fence, a central lotus medallion embedded in a square and various sculptures in bas-relief on the ceiling are clearly distinguishable. There are several fish, and also other, unidentifiable reliefs on the ceiling of this pavilion. The pillars of the frontal porch have a square base with naga heads on the corners and a sixteen sided column. On the podikai of the porch are depicted the human head with fangs resting on a pair of hands as well as four-leaved medallions we also saw on the podikai of the pavilion near Mahabalipuram . The pillars of the raised platform are alternately square and octagonal with depictions of deities. In the center of the roof face we see another human face with bulging eyes, arched eye-brows, with fangs and wearing ear-disks, resting on hands, this time in high relief. Below it is depicted the outline of a pair of parrots facing an outline of something that is not completely visible because of the curve of the roof (Figure 20). The parrots form a kind of heart-shaped figure, with another heart-shaped figure in between. To the west of the Vinayaka shrine is a large tirtha or sacred water-place. No other structure seemed to be nearby, except some modern houses. This reminded me immediately of the other pavilion with extensive eclipse related reliefs on its ceiling. The mysterious pavilion near Mahabalipuram also forms a complex with a Ganesha shrine and a tirtha. Although this tirtha, or tank, is in dis-repair, what remains of it can be clearly seen from the pavilion . On the Chingleput – Kanchipuram road I discovered one more pavilion (Figure 21) with a ceiling dedicated to solar and lunar eclipses and animals like fish, makara, a tortoise, a lizard and a tiger (Figure 23a to 23g). This pavilion, like the one near Mahabalipuram, is structured from four by six pillars, with an open porch and a raised floor area. But this one is open on the longer side, the raised floor is much higher, and it is closed off on three sides with granite walls, like the one next to the Vinayaka shrine on this same road (Figure 19). It does not have any lotus medallions on the ceiling but one simple lotus medallion is depicted on the podikai of a pillar of the porch. One relief shows a fish ‘kissing’ a human head (Figure 23d). It has both Chola and Pallava type podikai, and its pillars have a square base, with an octagonal column, with primitive reliefs of what are probably the donors, and rudimentary naga heads on the corners (Figure 22). The style of the pillars generally indicates a date in the 16th to 17th century, although some podikai are of the type applied by the Pallava architects (5th to 8th century). It is possible some older material was used to erect this pavilion, or that it is a renovation of an older structure. It is therefore not possible to say anything definitive about its date without other evidence, for instance epigraphical references . When I came across these two eclipse related pavilions on the Chingleput to Kanchipuram road, I actually was on my way to the Kailasanatha temple in Kanchipuram. I had a vague recollection of strange fish on one of the ceilings there and wanted to check it out. This temple is one of the most ancient structural temples of south India . My memory had not betrayed me. On the southern side of the mukhamandapa of the temple is a raised platform which gives access to the entrance of the temple (Figure 24). Its ceiling is covered with reliefs depicting the now familiar strange fish (Figure 26a to 26d). And on the pillars which support it we also find several symbols found to be related to eclipses elsewhere (Figure 25). But it also became clear this porch is out of context and the pillars and ceiling do not belong to the Pallava period. The attending priest told me that the original front mandapa had collapsed some two centuries earlier and had been repaired. The pillars and ceiling are granite instead of sandstone like the rest of the temple. And the decorations and reliefs belong approximately to the period of the Nayaka dynasty and the 16th to 17th century. The ceiling and pillars of the front porch also belong to this period. And the fish and whales depicted on the ceiling, as well as some of the symbols on the pillars, connect them to eclipse reliefs I found in Mahabalipuram, Bhavani, and the pavilions by the side of the Chingleput-Kanchipuram road. There are no nagas or lotus medallions here. But several other symbols carved on this porch can be connected to eclipse symbolism. The explanation I would like to suggest is that this ceiling was brought from elsewhere, maybe in a hurry, or because of lack of materials, to repair the porch of the temple. All eclipse related symbols, like nagas with disks, lotus medallion, were discarded because they were considered un-fitting for this temple. On this ceiling we find several fish I have called makara, because of their trunk-like coiled snout (Figure 26a). One fish also has a curled tail (Figure 26b). One or two are possibly stylized or incomplete representations of sperm-whales, or possibly a sperm whale and a dugong or seacow (Figure 26c). The animals are actually rather strange; this identification suggests itself because of the sperm whale depicted on the ceiling of the pavilion in Mahabalipuram . Some have human eyes (Figure 26d). The pillars that support this porch are very simple. They are alternating square and octagonal in shape with rudimentary decorations (Figure 25). Some of the symbols are disks, a disk within a disk, and a kind of petalled medallion. In perspective of the eclipse symbolism we have found in other places these disks could very well also be solar and lunar eclipse symbols. One other symbol is depicted on several pillars here. It is a kind of up-side down heart symbol reminiscent of the spade of a card-game, which had no significance to me at the time, but which I had also seen in the pavilion near Mahabalipuram. To this symbol I will return later in this article and I will explain its connection to solar eclipse symbolism. After the Kailasanatha temple I visited several of the lesser know early temples in Kanchipuram and found more eclipse depictions and eclipse related symbols carved in relief on ceilings and in a gopuram. The Amareshvara temple is a Shiva temple with a sanctum from the period of the Pallava dynasty (5th to 8th century) and an open pillared porch belonging to the later period of the 15th and 16th century (Nayaka period) (Figure 27). On the ceiling of the porch we find makaras and nagas flanking a lotus medallion in a square, fish, and solar and lunar disks (Figure 28, 29). A single pillar on a corner of this pillared pavilion has been decorated with reliefs of a high quality depicting several forms of Shiva and Vishnu. We find Nataraja, Bhairava and Narasimha among several others. This pillar is unusual in several respects. Instead of naga heads on the upper corners of the base it has Shanka Nidhis, small dwarf-like beings blowing a conch . And in the center of the panel between them again the same heart-shaped symbol reminiscent of a spade of a card-game we found also in the Kailasanatha temple, the Cintamani Vazhittunai Vinayakar temple and in the pavilion near Mahabalipuram. The same symbol, in slightly different form appears on the next column of this porch, and as abstract decoration on a patika. Also in the gateway of the Jvarahreshvara temple we find fish, disks and other eclipse symbols. And the ceiling of the sanctum of the Chokkeeshvara or Shri Kausikeswarar shrine is decorated with the lunar and solar disks about to be swallowed by a snake, which are known to represent eclipses in the tradition of the temple . I promised earlier I would return to the heart-shaped or spade-like symbol depicted in so many places where we found eclipse related reliefs. Below I have arranged a selection of photos, which speak for themselves, I think (Figures 31-35). We have here the opportunity to observe the evolution of a set of figurative eclipse related symbols, the naga or cobra with the solar eclipse disk, flanked by two parrots, into a completely abstract figure. Without seeing this evolution or knowing the tradition it would be difficult to interpret this symbol or guess its astronomical significance. Summarizing we may conclude that at one time the astronomical events of solar and lunar eclipses held so much significance to the people of ancient and medieval India that such events were documented with the erection of special shrines, pavilions and possibly sacred tanks. Sometimes within existing temple complexes, but also as independent structures. We knew that eclipses were considered sacred and auspicious astronomical events through the epigraphical record, tradition and doctrine, but we had not recognized these eclipse related reliefs with their astronomical symbolism. It underlines how important and significant the experience of an eclipse was. Important enough to erect special structures covered with symbols and sculpture to give witness to these experiences. And the people who witnessed these astronomical events not only erected these monuments in memory of these astronomical events, but also consciously intended to leave records of them for future generations. Now it is clear several symbols and animals depicted in the sculptural program of south Indian temples are related to eclipses and are therefore also astronomical in nature. To recapitulate: the lotus medallion within a square, the nagas or cobras ‘chasing’ a solar or lunar disk, the fish, either single or in pairs, the makara or composite fish, the tiger, the moray eel, the sperm whale, the tortoise, the gandha bherunda or two-headed eagle, the human head with fangs resting on a pair of hands, the scorpion, and the lizard. And last but not least parrots, sometimes in pairs forming a kind of heart-shaped or spade-like symbol.